-1 packet of 'Tilda' microwaveable Brown Rice & Quinoa - Of course you can boil both of these fresh but these ready made packets are so tasty and take 2 minutes to cook. Using a spiralizer, create the courgetti then place it into a non-stick saucepan with the olive oil and salt & pepper, allow to simmer on a low heat for about 5-10 minutes (don't let it fry) - this will allow the courgetti to soften a little. Chop up the sun-dried tomatoes into small chunks. Set aside some of the oil the tomatoes come in to later pour over the salad. 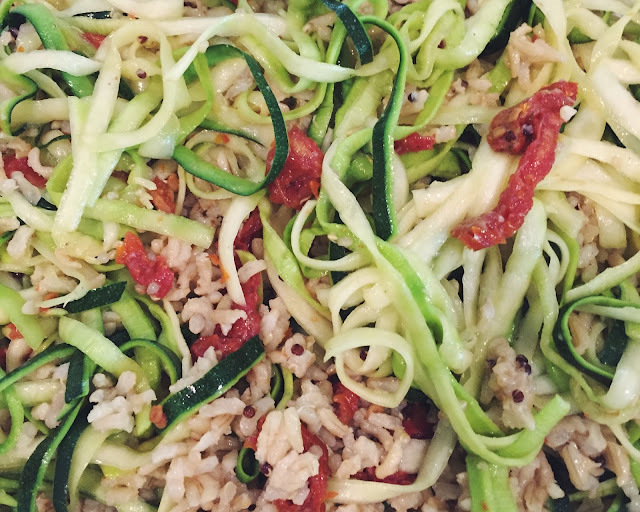 Heat up the rice & quinoa then place it into a big bowl along with the courgetti and sun-dried tomatoes. Give it all a good mix and season -can be served either hot or cold, both just as delicious.